Bakkhara is a Khajiit member of the Mages Guild. She can be found near Elden Hollow contemplating how to stop Canonreeve Oraneth from completing her ritual. She is unable to directly interfere because Canonreeve Oraneth is a member of the Thalmor, so she asks you to clear a path to the altars. After defeating the Canonreeve, Bakkhara and the other mages are unable to disable the final altar. She orders everyone else out of the room but stays in a final, unsuccessful attempt to prevent the ritual completing. Her final words to you are; "Oraneth is dead, the ritual broken, yet evil still stirs here. There is a darkness growing from the earth below, sprouting from a seed of death. We have failed. The darkness is coming, with no one to control it..."
Needs dialogue from outside the dungeon. Bakkhara: "And what do we have here? Someone who bypassed the Thalmor guards? Hmm...."
Bakkhara: "This altar's design suggest complimentary ritual sites. Bakkhara bets an eel pie there are more." Dracien Montue: "By Sheor's beard...it's a massacre in here!" Bakkhara: "It is good work. If you want to make a stew, you must gut a few fish, no?" Bakkhara: "This one still feels a presence. There must be another altar." Tell me about the Canonreeve. "Oraneth was a Guild Mage once, many moons ago. She believes the Altmer are superior to all races in the ways of magic and, therefore, worldly pursuits as well. I found her amusing, if only because her beliefs are objectively wrong." Why do you suspect her? "The Canonreeve has been very vocal about wanting the Altmer to abdicate from the Aldmeri Dominion. When the Thalmor opposed her proposition at a public hearing, she swore she would save the Empire herself." And so you suspected wrongdoing on her part? 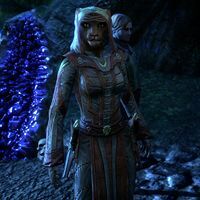 "She recently visited several Mages Guild chapters, asking for advanced texts on Conjuration, and a few about the Daedra. And now she's come here with fully-armed guards. Nothing wrong with research, but she's up to something, yes?" Bakkhara: "So. Oraneth sold her soul completely. The Thalmor will not be happy with this." Speaks-With-Lights: "Bakkhara, look! Just as you feared — the ritual is complete. See how the darkness gathers?" Dracien Montue: "What in Oblivion was that?" Speaks-With-Lights: "Mistress Bakkhara, what are you doing? We must go!" Bakkhara: "No, you must go! Warn the Guild. Warn Tamriel! Quickly now — Bakkhara can't hold this forever." Xal-Geh and Aeren, two fellow mages located outside the Mournhold Mages Guild, will gossip unkindly about her.